Chanukah Sameach and Season’s greetings to all. As I sit here watching the light of the first candle reflect the wonderful miracle of Chanukah, I also reflect on the miracles being performed daily at Hadassah hospital. Some of the fantastic pictures on the website here bear testament to those miracles, still more you hear from friends, neighbours and other patients at the hospital. Waiting at the airport a few weeks ago to meet my elder daughter (who lives in the UK), I sat beside an American couple waiting for the rest of their delegation to arrive. 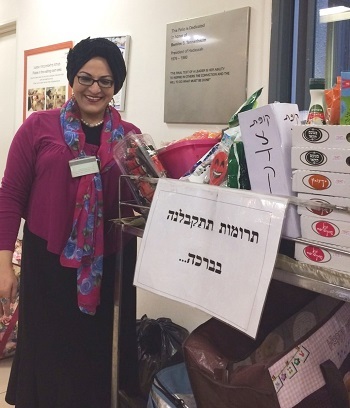 Having noticed that their suitcases had a Hadassah mission label, I had the opportunity to chat with them where they told me their very positive personal experience with the hospital – the reason they had joined the mission, and the reason why they make significant donations to Hadassah each year. I have spent more time at Hadassah these past few weeks than I’d hoped to, mainly in the Neurology Department. 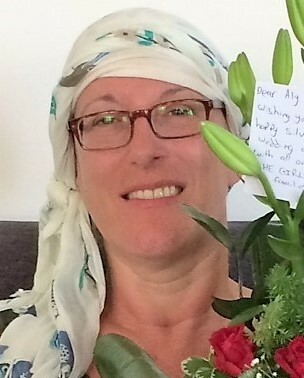 From my last blog, you may remember that I was waiting to know if my course of chemotherapy would be allowed to restart after some setbacks just before Rosh Hashanah. Well the good news is that I have restarted, but the less good news is that it has resulted in some additional stress-related symptoms. One phone call to the oncology department and I was invited in the very next day for a series of tests to be sure that these symptoms were not caused by changes in either the brain tumour or M.S. Fortunately they weren’t but it was hugely comforting to be seen so quickly and assessed so thoroughly by a team who really do care about you, the patient. Being back in neurology so much these couple of weeks, has given me to opportunity to see even more of one of the greatest unsung heroes at Hadassah. Miri is an ageless lady with a wonderful smile and empathy for every patient. She is a volunteer who brings a snack trolley around certain wards and departments in the hospital three times a week. The trolley is literally groaning with a selection of sweet and savoury snacks, soft drinks and is overflowing with the love and personality of this one special woman. She and her husband personally fund the trolley with only very small donations, and she attributes the birth of her three (now adult) children to the thrice-weekly volunteering she does. She has a kind word for every patient of every religion and nationality she encounters. Cancer and its treatment can play havoc with your taste buds and appetite and Miri ensures that there are always healthy snacks available – as well as sweet sticky snacks for those who need those! She is such a positive force of nature that even if you can’t face eating, you will find yourself nibbling some special cranberries or dates that she keeps aside especially for these moments. She also keeps an eye on the staff at Hadassah and makes sure nobody in the departments she is visiting, goes without. At this time of Chanukah, where we reflect on, and celebrate, the miracles which kept the Jewish people and their symbols alive, the miracle which is Hadassah hospital takes on even greater meaning. If each department at Hadassah were a branch on a huge menorah, you would see what a solid and firm foundation holds this menorah in place. This hospital would simply be unable to offer the services it does – treatment, support and so much more – without those foundations. The foundations are each and every person, in Israel and around the world, who has supported Hadassah either financially or in other ways, and as a fortunate recipient, I thank you all and wish you a Chanukah filled with warmth, light and good health.